A diamond wedding anniversary celebrates sixty years of marriage, and is an important milestone for any couple. Achieving sixty years of married bliss is definitely something to be celebrated, and traditionally, couples who celebrate this amazing achievement are given special gifts to mark the occasion. Whether you are planning to buy a diamond wedding anniversary gift for your husband, wife, parents, grandparents, or other relatives or friends, we’ve put together a list of some of the best gift ideas to consider. From traditional diamond wedding anniversary gifts to the more unique, you’re sure to find something that they’ll love. Traditionally, couples who are celebrating their diamond wedding anniversary together are given diamonds as a gift. 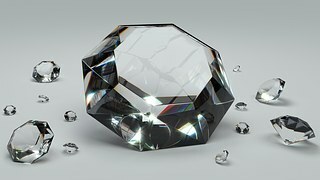 Since diamonds are an expensive investment, this can make the perfect gift idea if you are planning on treating your husband or wife to an expensive anniversary gift, or are looking for something amazing to give to your parents or grandparents, for example. Diamond jewelry is a wonderful gift idea, with plenty of different pieces, styles and even colors to choose from for both men and women. To browse a range of stunning diamond jewelry, see Ascot Diamonds. If you’re hoping to buy a special gift for a wonderful couple in your life who are about to celebrate sixty years of marriage, personalized gifts can be a lovely choice to make. There are plenty of gift ideas that you could choose from, including personalized photo albums which reminisce over their marriage and life together, or even household items with their names or ‘Mr & Mrs’ displayed, such as cushions or placemats. Engraved gifts are also a great choice for a diamond wedding anniversary, with many great items to choose to engrave, such as wine glasses or a decanter. If you’re planning to purchase a diamond wedding anniversary gift for a couple who love to do things together, a gift experience is the perfect choice. For example, paying to send the happy couple on a weekend away together, a meal in a five-star restaurant, or perhaps even a spa experience is a lovely idea that they will be able to use to make even more lovely memories together. There is a massive range of great experiences to choose from which you could give as a gift, whether you’re keeping it simple or looking for something special and unique. Last but not least, a diamond wedding anniversary is the perfect opportunity to remember your wedding day and the happy, amazing time that you had. Because of this, gifts which recreate those that a couple were given at their wedding, or gifts which use wedding photographs can be the perfect choice if you’re looking to give something that is touching and meaningful but doesn’t cost a lot. Sometimes, a simple wedding photo album can make for a lovely diamond wedding anniversary gift that will be cherished. Whether you’re planning to buy a diamond wedding anniversary for your spouse, parents, grandparents, or another couple, there are plenty of wonderful ideas to choose from.